The Common Krait (Bungarus caeruleus) is a venomous snake and a member of the big four that is responsible for maximum human deaths across India. It is smooth scaled, head slightly broader than the neck; eyes entirely black. It is usually found in glossy black, pale faded bluish- grey or dark brownish-black with narrow paired white bands that continue till the tail. Vertebral scales are Hexagonal in shape. 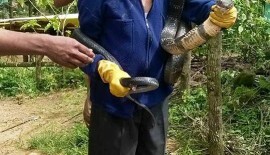 Head & neck are black with no patterns. Nocturnal in nature, it is alert and active after dusk until early morning. During the day it is found generally resting inside rodent burrows, termite hills and brick and rubble piles. Found in farms and gardens, the Common Krait is cannibalistic in nature and also preys on other snakes. Some other animals forming its prey base are rodents, lizards and frogs. Common Kraits are oviparous and lay between 8-12 eggs between March and May which hatch in about 60 days. The female stays with the eggs during incubation. 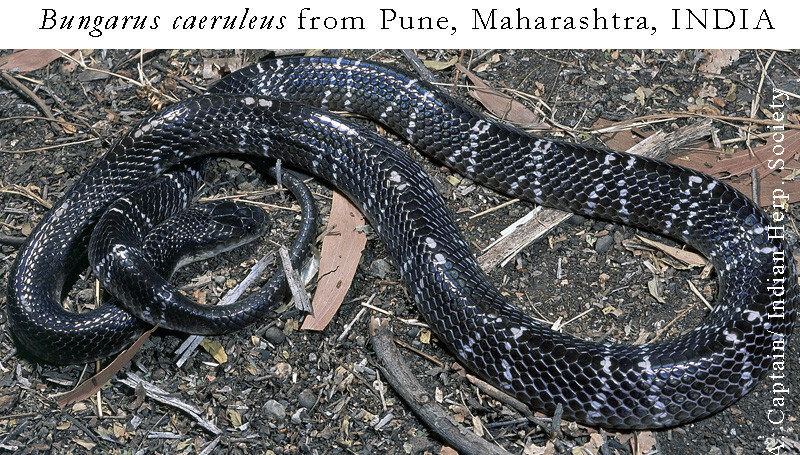 The Common Krait’s venom is the most potent amongst the big four and is neurotoxic in nature. It’s bite is not painful as compared to the Cobra or viper bites. 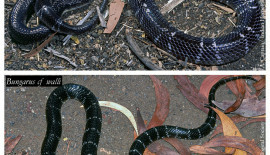 Snakes that can be mistaken to the Common Krait are Common Wolf snake (Lycodon aulicus), Barred Wolf snake (Lycodon striatus), Bridal snake (Dryocalamus nympha) and other kraits like Wall’s Sindh Krait (Bungarus sindanus walli) and Northeastern Hill Krait (Bungarus bungaroides). It occurs in most part of mainland India except the north east.